"Dear children, it is important that you realize that abortion is the key issue which is bringing about the demise of mankind. If abortion was defeated, the path of reconciliation between the heart of the world and God the Father would be laid bare. Then you would see wars cease, economies stabilize under righteous leadership, moral degeneration reversed, disease and famine greatly resolved and natural, as well as manmade disasters, lessen." "For I tell you, evil begets evil. Remember, dear children, one Hail Mary said from the heart can stop wars, heal diseases, change hearts and bring victory of righteousness over evil. Therefore, I have come to mobilize an Army of Prayer - not just here, but around the world. I call it ONE ROSARY A DAY FOR LIFE. This is your Heavenly Mother's call to arms. Be united in this effort, dear children, as I call you to be. 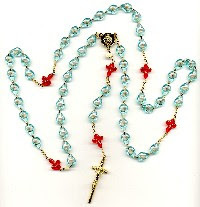 Jesus and I will help you spread 'One Rosary a Day for Life' around the world." "You do not need anyone's approval to pray or to evangelize prayer. You should encourage people from every part of the world to enlist in this 'army' of prayer." "I am always your Mother, your support, your partner in all that is good; but this Army of Prayer must be spread quickly to be effective - and, so, it is My most precious and personal project. Make it known."